It is rare to see a team lose its three most crucial players all within the same transfer window. Yet over the course of 2016’s off-season, Borussia Dortmund have surrendered Mats Hummels, Ilkay Gündogan and Henrikh Mkhitaryan to Bayern and Premier League. Despite such big losses, Tuchel and the management have replaced well and the squad is looking promising for the coming season. Reinforced by the signing of numerous young players alongside Schürrle and the return of Götze, Dortmund have a squad with great potential with the next few seasons in mind. However, their most important player may have already been at the club. Signed from 1860 Munich for a negligible £1.5m last Summer, Julian Weigl developed in leaps and bounds last year as he quickly cemented himself as a starter in Tuchel’s positional play system. Despite being fairly unknown before moving to his new club, the young 6 has a heightened team-tactical intelligence which allows him to complement Dortmund’s game in a plethora of ways. Before becoming one of Germany’s biggest prospects at Borussia Dortmund, Weigl’s footballing talents were fostered in Bavaria on the eastern-outskirts of Munich. Enjoying the majority of his youth career at SV Ostermünchen and later 1860 Rosenheim, it was in 2010 when he moved to the city in the calling of 1860 Munich. Joining them at 14 years, it was to be four years until he made his first-team debut, against Ingolstadt in the 2. Bundesliga. From an early age, the characteristics which Weigl is known for were apparent. Despite the poor performance levels of his team, the midfielder showed a heightened understanding of the game with an above-average technical capacity. However, this came not in the playing role that we see Weigl in now, but as an attacking midfielder in a 4-4-1-1 formation. Out of the numerous features of Weigl’s game, the one which showed earliest is his dribbling and pressing-resistance. From his first season in 1860’s first team, his ability to dodge tackles with slight touches and agile turns was a big part of his game. Such a skill would have been cultivated by his higher position in the team. Taking on the role of an attacking midfielder, he will have been more accustomed to dribbling in tighter spaces and is one of the reasons he’s so elusive to defenders as a 6. On the other hand, the two main attributes which seemingly came later in his development were his passing ability and positional intelligence. Both prioritised by Tuchel’s playing philosophy, this comes as little surprise as the manager worked closely with the £1.5m signing. At 1860, his passing lacked the same level of penetration that it does after his first year at Dortmund, whilst the intelligence of his positioning has seen the biggest change. Obviously, his higher role in Bavaria makes this respect difficult to compare. Weigl’s place in the 4-2-3-1 of last year. Despite being a young and inexperienced newcomer to the squad, Weigl’s integration into Tuchel’s new system was near-instant and extremely effective. From the 4-0 win over Gladbach on the opening match-day, he performed at a high level and the execution of his role was exemplary for a player of his age. Acting as the deepest member of a midfield triangle, Weigl was most relevant during Dortmund’s build-up. He often had the task of receiving directly from the centre-backs, or creating space for the likes of Hummels to advance with the ball. Upon this task being completed, the impetus was set on progressing the ball past the opponent’s midfield line, where the likes of Mkhitaryan and Kagawa would be closely positioned to combine between the lines. With the ball in the final third, Weigl acts to recycle the possession, offering a stabilising presence in deeper positions and, as always, connecting the positional structure together. His technical ability does give him the capacity to move forward when the situation allows, yet he generally stays in a deeper position to support the attack rather than acting directly within it. Weigl’s strongest attribute is his ability to complement Dortmund’s structure, providing connections across the deeper parts of the shape and creating the triangles which allow fast ball circulation. In a tactical system which prioritises positioning, the defensive midfielder was one of the most important players from a strategic perspective last year, perhaps second behind the genius of Mkhitaryan. The 6 interprets his team’s shape very well. He always shows a competent understanding of which spaces to occupy and which to open, where connections are required to bridge the structure most effectively. He doesn’t often drift away from the three central columns, as a central position theoretically gives him the best capacity to connect as many team-mates as possible. Weigl moves often to create links between his team-mates, creating a more connected positional structure and increasing the capacity for players to interact with one-another. Weigl is key for the creation of triangles in Dortmund’s build-up. Take the above scene for example. Dortmund have a 3v2 against the opposition press, but the spacing of the players is weak, making this numerical advantage rather negligible. There are no options for a 3rd line pass and ball circulation between the three is rather predictable and easy to defend against. However, Weigl drifts over from the left half-space and creates the 4v2 and, just as importantly, a much stronger spacing between the players. The 3rd line pass is available, whilst two triangles are formed with a much greater potential to penetrate the opponent’s first line and break through into the midfield. Sticking close to the defensive midfield position, Weigl is often very ball-oriented in his movement as he tries to stay present in the build-up. Off of the ball, he’s highly active in searching for the connections needed to help his team build-up in his very team-oriented playing style. It’s rare to see him stood still as he’s constantly adjusting to the ball circulation and changing of his team’s structure, making sure the connections are maintained even if Hummels drives forward or Gündogan drifts wider in the right half-space. Weigl is a key actor in Dortmund’s strong positional structure. Although the spacing of the entire team has improved under Tuchel, it’s the defensive midfielder who is particular important. Where Dortmund create triangles across the structure, it’s often Weigl who’s acting as the third man, especially in the deeper areas where he creates the crucial links between the defensive line and the midfield. Take the below scene for example, had Weigl not been positioned there, Dortmund would have zero strong triangles to pass the ball with. Yet by positioning himself where he is connected to all four players, three crucial triangles are created which the team can circulate the ball through. Weigl is key in creating a strong positional structure. 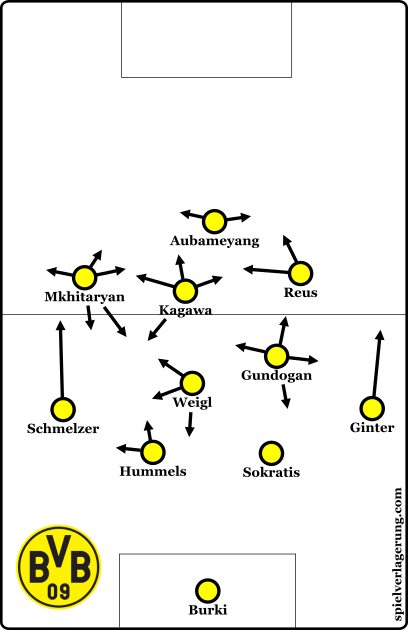 Through his presence in forming a connected structure, Weigl is crucial for Dortmund’s ball circulation. Without a player of his talents in the middle, Dortmund can be at risk of having a more isolated ball circulation and not being able to move the ball through the whole team. Some players may be out of reach from the ball, or being 3 or 4 passes away from receiving it when they could be just 1-2 passes away if a team-mate is linking the shape. By connecting the structure, Weigl enables the team to circulate the ball through not only more players, but through more space too. His structure-complementing ability is not only in effect during the earlier stages of possession, as at times he is just as important in the final third. From a position in the deeper midfield areas, he’s often free to recycle possession and relocate the attack whilst connecting the attackers from a deeper position. This is particularly important when Dortmund look to switch the possession and create isolations, but also helps if the team isn’t appropriately prepared to break through the defence and need time to readjust. With the ball in an isolated corner, Weigl offers a way back into the centre. Overlooked is the timing of his movement, which allows him to open connections at the ideal time for the ball-carrier and his team-mates. He links the structure so that the ball can be moved whilst shifting to readjust before the opposition have time to disrupt the connections. As a result, Dortmund can sustain a clean and well-spaced positional structure and prevent the opposition from disrupting it effectively. Having a strong positional structure is crucial to many aspects of play in possession. Most notably it allows a team to use as much space on the pitch as possible by occupying the most space whilst staying connected between team-mates. Many teams’ structure is stretched across the width of the pitch, yet they lack the players in the middle to take advantage of any space created. It is players such as Weigl who are key in connecting the shape in the middle. By improving his team’s spacing, Weigl also helps Dortmund achieve a level of collective pressing-resistance. The better-connected structure results in more passing options for the ball-carrier and the immediate options for the next pass. Obviously, this requires a more co-ordinated press from the opposition and often, more players to be committed. As a result, a team is generally more capable of working around the opposition’s closing down or potentially even prevent it altogether. When off of the ball, Weigl is not only moving to connect the shape but he’s constantly scanning the pitch. The young midfielder diligently glances across the pitch, observing the positioning of other players and thus where space can be found. He’s very rarely ball-watching, but seemingly prefers to consider as many relevant reference points as possible – most notably his team-mates and the opposition. By making such frequent scans of the pitch, Weigl maximises the amount of visual information he can intake in a period of time. This information can then be used to complement his decision making, paired with the (great) tactical knowledge that the midfielder already possesses. Weigl’s intensive scanning heavily supports his ability to carry out the numerous crucial roles of his position. His greater perception of the space on the pitch allows him to manipulate it more effectively. The timing of his movements off of the ball is aided by his clear knowledge of the opponents’ positions. Weigl can more accurately distance himself from any pressing opponents, allowing him to receive the ball in space or disrupt the opposition structure by dragging them out of position. Yet whilst Weigl is observing the positioning of the opponents, his knowledge of his own team-mates is of a similar importance. Because of his important responsibility of complementing the collective structure, he needs to know which position is best to link his team-mates as well as possible. Through scanning the pitch and forming a clear image of his team’s overall structure, Weigl can more accurately pinpoint the optimal positioning to create triangles between team-mates. Aside from aiding his influence off of the ball, prior scanning is also crucial in supporting his actions with the ball at his feet. His knowledge of the opponents’ positions gives him an accurate estimation of how much time is available, as what direction the pressure may come from. His understanding of where his team-mates are positioned means that he often knows what his next action will be before the ball even arrives at his feet. Because space is a construct of all players’ positioning, he also has a good knowledge of what space is available to move the ball into. It’s a trait shared by many top footballers, too. When actually on the ball, Weigl is a surprisingly good dribbler. Blessed with an ability which defensive midfielders rarely have, he uses slight touches and small, compact dribbles to evade opposition pressure and open space. In a manner which is at times reminiscent of a certain Sergio Busquets, he keeps the ball away from any tackles and maintains control over the ball with apparent ease. His composure with the ball is at an extremely high level, never seeming to be challenged when closely-followed by opposition pressers. Despite a degree of urgency, his touches are never rushed and he keeps the ball close to his body in order to have greater protection from any prospective ball-winners. With his technique not being wavered greatly by opposition pressure, he’s able to dribble quite accurately in tighter spaces. Weigl’s high level of understanding and perception of the space is retained despite the pressure and enables him to better avoid opposition challenges. In such scenarios, the defensive midfielder seems to always know the position of his opponents and his team-mates, as well as any gaps in the surrounding area. Through retaining such perception, he is much better equipped to dodge oncoming challengers and then to move the ball into any gaps left by the pressing team. Because of this rather unique quality, Weigl’s presence in Dortmund’s build-up of possession adds some valuable pressing-resistance and poses a challenge for the opposition. He is able to keep control over the ball despite pressure and this can often force the opposing team to employ a greater focus on the young defensive midfielder. In turn this can then create space for other team-mates who can progress the ball themselves. As a passing option for team-mates, greater trust can be given to Weigl as a safe option. His ability to evade the defenders means that he’s a safer passing option than say, giving the ball to the technically-weaker Matthias Ginter. Even if a defender is close by to him, Weigl’s technical and perceptual abilities means that he is still a fairly safe passing option and the risk of a turnover is unlikely. From a more attacking-minded perspective, Weigl’s pressing-resistance is a useful tool for breaking opposition lines and creating space in the midfield. Often in Dortmund’s build-up, Weigl has been able to dribble away from pressure and thus move the ball into areas of less defensive-coverage. His heightened understanding of space allows him, and Dortmund as a whole, better create and utilise open gaps to help them move the ball forwards. Players spend their entire lives memorising patterns and information to aid their understanding of playing and ultimately, performance. Unconsciously, they recognise consistencies in areas such as body shape which determine the outcome of a particular action. These patterns are usually simple things. If a player glances in a direction before passing then he’s going to target his pass at that area, if he opens his hips before passing then it’s going towards his side. As players unconsciously develop these patterns, they begin to create reactions to these cues which can help them to intercept the actions. Through training and match experience, players are continuously improving their perceptual-cognitive capacity – their ability to identify information and integrate this with existing knowledge to facilitate their selection of an appropriate reaction. Whilst this perceptual-cognitive ability is largely beneficial, it can become problematic when the information which they receive is deceptive. It’s exactly why shot feints are an effective tool for attackers – the backlift of the (supposed) striking foot triggers the defender to prepare for a shot which will never come, allowing the forward to adjust and move past the unprepared opponent. Because motor programs are so ‘hard-wired’ into our cognitive processes, the reactions become automated and difficult to prevent at times. Even if the player realises that he has been caught out by a ‘fake’, it’s difficult to re-adjust effectively and maintain defensive control. Therefore, through the use of deception, a player can trick his opponent into making an inappropriate action. This can bring significant advantages for the attacking team – obviously it can help them to win 1v1 duels, but it can extend much further than that. Deception can be used to a more large-scale effect, creating space, opening up passing lanes and finding a ‘free man’. So what makes all of this relevant? Julian Weigl happens to be very good at it. Although Weigl is not necessarily a purveyor of flashy tricks, the subtleties of his body shape and movements can mislead his opponents. It’s often sly intricacies such as a quick glance, or the angling of his lower body, which sends the defenders the wrong way. Such details are far from being obvious to the casual watcher, yet it’s a crucial component of why his passing from deep can penetrate the midfield so effectively. One of the most common instances in which Weigl looks to deceive his opponents is in his passing. Through the use of deceptive techniques such as feints and pauses, the defensive midfielder can give himself more time to make the pass, open space for team-mates or widen the passing lane which will be accessed. It complements his passing well, making it more easily-made and more importantly, making it a more dangerous threat against the opposition defence. Due to his size, Weigl has to use his footballing intelligence when Dortmund are out of possession too. Instead of directly challenging his opponents, he prefers to win the ball through interceptions where his accurate anticipation of the game is emphasised. He covers passing lanes well when defending Dortmund’s own half, reading the opponent’s passing well to recover the ball before it reaches its destination. This style of defending complements Dortmund’s pressing game fairly well. Weigl is often on hand to sweep up any direct results forced by his team-mates further forward. Whilst his team-mates close down the opposition’s build-up, Weigl can use his strong anticipatory abiltiies to cover a large area of space and intercept any attempted clearances. Weigl has a good anticipation to intercept the ball consistently. His rather frail build doesn’t make him a pushover in duels however. He’s more than open to taking a direct approach to defending when needed, making up for any physical inferiority with a superior intensity. Another way in which Weigl works around his lack of strength is in the accuracy of his tackling. If possible, he tries to ‘poke’ the ball out of the feet of the opposition – something he does cleanly and effectively. He’s quick to react in the small window of opportunity when this is possible, and looks to steal the ball in a sly manner. It’s particularly effective when backwards pressing, as it allows him to catch his opponent unaware from his blindside. From his deeper position, Weigl also brings stability in moments of transition. Just like he reads the opponent’s passing, he anticipates the direction of any loose balls if Dortmund’s attack breaks down. In one of a few similarities to Sergio Busquets, he’s quick to react and reach the ball before it’s picked up by an opponent looking to initiate a counter-attack. By regaining the ball quickly, Weigl can restart his team’s attack and potentially even exploit an opposition primed to move up-field in any counter-attacking endeavours. No longer sided by the excellent Ilkay Gündogan, there is a large argument to suggest that Weigl is now Dortmund’s most important player. Although Marc Bartra is a competent addition, Dortmund’s build-up is now lacking the extraordinary playmaking capabilities of Hummels. The now-Bayern centre-back’s direct passing is no longer a threat to opposition pressing, and they may be more inclined to challenge Dortmund’s build-up as a result. Because of this, the priority on creating well-connected structures is even greater, as it enables a safer and more effective short build-up. In addition to this, Dortmund may be requiring more from Weigl’s passing itself after the loss of 3 important playmakers in the team. Henrikh Mkhitaryan had his best season last year and finished with 15 assists at 2.7 key passes per game, whilst the side struggled noticeably whenever Gündogan was absent. Whilst, although his influence is less quantifiable by basic stats, Dortmund’s build-up was at-times solely made through Hummels last season with his highly-consistent direct passing being a constant threat from deep positions. Due to these losses, Weigl’s passing ability may be relied upon more as a tool to directly progress the ball and create chances in Dortmund’s attack. It seems that Tuchel has made his young defensive midfielder aware of this, as Weigl himself stated in a pre-season interview – “I want to develop even more. I want to try and place that deadly pass and not just go for the easy option.” Although it will require a combination of many factors in order to replace the playmaking lost over the summer, Weigl’s presence is central to the effort. On this basis, it’s possible that we will see a more attacking-minded Weigl throughout the 2016/17 season. As opposed to the pairing with Gündogan last year, Sebastian Rode provides much greater defensive protection and this could give the young midfielder the licence to move forward more. His importance in this area of Dortmund’s possession game was highlighted in their season-opener against Mainz on Saturday. Dortmund had struggled for the first 60 minutes to break through Mainz’ tight and man-oriented midfield line. The double-pivot of Rode and Castro had been largely ineffective and struggled to make vertical ball progression for large periods. Weigl’s first action was to deceive his defender, before receiving the ball on his blind-side and playing a pass through the line of Mainz midfielders. Notice how he sees his defender check over his left shoulder then immediately steps to his right, coming out of his cover shadow and receiving the pass. After the defender sees Weigl over his left shoulder, he obviously has the knowledge of his man’s positioning and is confident in his coverage. Weigl deceives him though by immediately moving to the right of his defender, catching him unaware on the opposite side to the one he had just checked a second ago. But aside from this small clip, Weigl complemented Dortmund’s game in many ways. Their build-up improved considerably as a result of a better structure (which albeit worsened towards the end of the game), whilst Weigl’s passing was more penetrative than what Rode and Castro’s had been put together. His presence in the build-up gave Dortmund an added stability which was important as Mainz were beginning to become a greater threat during these moments. Either way, the future is promising for a player who has already developed at an outstanding level. One more year under the tutorship of Tuchel as well as certainly a more prominent role in the system could see Weigl move onto new heights as Dortmund look to recreate last year’s level. Thanks, awesome article. I always love it when you also provide some videos instead of graphics! Great article, I always enjoy your Twitter breakdowns! Seeing that he played as an attacking midfielder before, could it be that he’s working his way on becoming something between a defensive midfielder and an attacking midfielder – the advanced playmaker? What I’m really asking is, could he, and will he replace Gundogan? He himself said that he wanted to be more attacking. He IS irreplaceable in Dortmund’s build-up, but could Tuchel implement him as an AP, with someone else (Sahin, maybe even Rode) filling his role? All in all thanks for this article explaining this great transfer of BVB; he won’t be underrated anymore when this season is over. I think the Busquets-comparison is definitely clear. I wouldn’t compare his style to Xavi though, just in the way they both intensely scan the pitch. If a pressing game is perfect, then wouldn’t it theoretically challenge even the best players in the world? I understand he has issues in some situations, but most players would struggle against a Bayern press for example, as you said. Against Bayer Leverkusen, he was key in breaking their pressure and they’re amongst the best in this area too. As the whole world talks about the killer pass, Weigl offers the first door to Dortmund’s attack, simply by picking up passes & passing it wisely. Will we see Weigl’s game progress in similarity to kind of a Xabi Alonso/Thiago? You stated that Weigl could be more adventurous in his ball playing, we could see him making more decisions in the final third also. It’s a good way to put it! Though I feel that people are becoming more aware of his excellence. I think it would more continue on the path of Busquets, but he’s young and shown versatility so it’s more than possible. Either way, the future is bright!